Bullis School has a long and proud tradition in athletics. Bullis has fielded competitive athletic teams since the 1930s when the school began as a prep program for the service academies. Bullis’s athletic program has had great success with teams winning league championships in almost every sport. This success has also produced national championships in Prep football, boys’ tennis and wrestling. At Bullis we believe in the value of athletics for the entire student body. Coaches feel the responsibility not only to teach their players the skills and strategy behind the game, but also to instill a respect for the tradition of the game including honorable behavior. Learning to honor the game builds a sense of responsibility and the maturation of moral reasoning. Coaches realize that what they are teaching their players carries far beyond the field into the classroom, into the home and eventually into adulthood. Coaches encourage their players to focus on their level of effort and personal improvement in addition to the final score. Our coaches help student-athletes recognize that mistakes are inevitable and an important part of the learning process. The key to success is being able to rebound from mistakes with renewed determination. Our coaches are expected to embrace two goals in all athletic endeavors: the first goal is to win, but the second, equally important goal is to teach life lessons through sports. One of the most valuable of these is an understanding of competition. Athletics are seen as an important part of the total learning experience at Bullis School. Those lessons are invaluable and help in the overall development of an individual. Sportsmanship, commitment, teamwork, competition, cooperation and fair play are learned when students are taught to respect the game—to bring dignity and self-control to the contest, win or lose. Athletic participation also plays an important part in helping each student develop a healthy self-image as well as a healthy body. 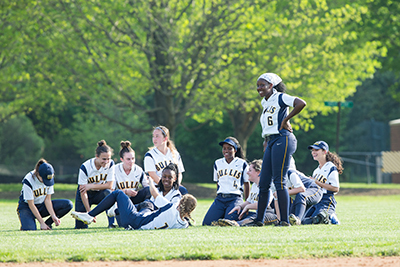 At Bullis, we believe that all students should have the opportunity to participate in interscholastic athletics during their middle and high school years. There is a place for athletes of all skill levels to represent Bullis in athletic competitions. During the Middle School years, participation on an interscholastic team is required every season. Upper School students are expected to participate in athletics or other approved after-school activities two out of three seasons each year. Successful independent school athletic programs depend on a large percentage of student participation. This fact encourages multi-sport athletes. Our coaches will not pressure players to give up other sports in order to secure a winning season in a particular program. Maintaining a culture where positive character traits are developed in our players must come first. When the game is on the line and tensions run high, we will teach our student-athletes invaluable lessons by helping them focus on what is really important. This athletic philosophy was adapted from the “Positive Coaching Alliance” vision statement. Bullis School entered into a partnership with PCA in August 2008. Only at Bullis could I combine studying art while also playing varsity soccer and ice hockey.